What if we have a problem and need help? Our Training is hands-on and our Support is proactive. That means we’ll be on-site to turn your staff into experts at EZSchoolPay, and regularly check in with you for as long as you use this software, giving you updates, troubleshooting tips, and more before you even have to ask for them. We’re here for you. The lunch lines move too slowly. Slow lunch lines are often the single biggest source of frustration for frontline cafeteria staff. That’s why EZSchoolPay uses an intuitive, convenient point-of-sale (P.O.S.) system with simple, but cutting-edge, technology to speed up your lunch lines. Plus, parental alerts regarding account balance levels reduce the chance of your team members having to deny a student her or his meal. Isn’t cash safer than handling money electronically? Not even a little. When done correctly (and with 256-bit, PCI-compliant digital encryption, EZSchoolPay does it correctly) electronic payments are much safer than using hard cash because digital transactions remove the risk of mishandling money and/or errors in data entry. 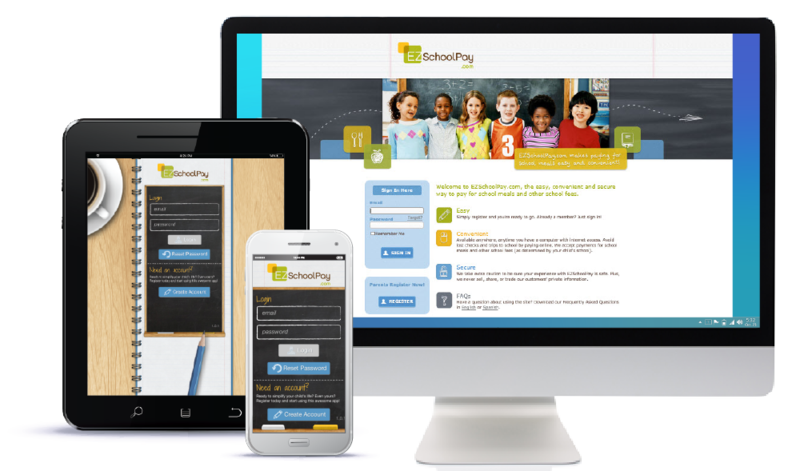 EZSchoolPay is the School Payment-Processing software that improves the way parents and students pay, School Nutrition team members collect, and district administrators account for and manage money. Speed up your lunch lines by replacing crumpled-up dollar bills and loose change with speedy click-and-go payments. Save time with no extra manual steps along the way, since this convenient system quickly processes and delivers all funds where they need to go. Incorporate parents’ needs by letting them easily add money to accounts (through the app or online, immediately and at any time), set up recurring automatic payments, receive low-account-balance alerts, and more, all of which helps to remove the word “forget” from the process altogether. Feel confident knowing all payments and accounting are secure and accurate by reducing cash handling and routing payments directly from the parents’ accounts to your district’s bank account. Plus, EZSchoolPay isn’t just for School Lunch transactions. Conveniently handle payments for yearbooks, school apparel, and any other dues or fees you collect. Reduce or eliminate cash handling to speed up serving lines and lower labor costs. Receive meal payments directly into the cafeteria Point-of-Sale (P.O.S.) system. Route funds directly into your district bank account within 24 hours. Protect parents’ card information with the most sophisticated security available: 256-bit, PCI-compliant digital encryption. Minimize negative account balances through automated low-balance notifications to parents. Easily report on transactions with a complete set of tools available for school and district administrators. Automatically direct online payments and parent convenience fees to your district’s bank account. Determine and set payment types, descriptions, and rules. Fully integrate payment processing with eTrition®, MealTracker®,CafeConnect®, Lunch Express®, go.edustar®, and ADM® solutions. Add funds securely, conveniently, and directly into student meal accounts at any time from the app or online. Rely on automated alert notifications for when the account balance drops below a certain amount. Use the payment app on iPhone, iPad, and Android devices.